RBH became AS9100 certified in November 2007. AS9100 certification is a globally recognized aerospace sector standard that defines the quality system requirements for suppliers to the aerospace industry. Achieving AS9100 certification demonstrates our commitment to delivering quality products and services to our current customers, and also strengthens our ability to win new customers worldwide in the aerospace market. 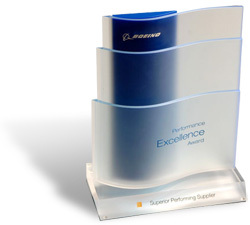 Boeing Performance Excellence Silver Award Recipient for 2007, 2008, 2009 and 2010. In order to qualify for the Silver Award, a supplier must maintain at least a 98% on-time delivery performance and at least a 99.8% quality rating for a 12 month period. copyright @ 2009, RBH Aerospace, Inc. All rights reserved.